Back in 2003, I had the chance to see Royksopp here in Boston. It was one of the better shows I've seen, to be quite honest. If I could find the pictures I took, I would share those with you in a heartbeat. That same night, I then went from the Paradise over to the Phoenix Landing to check out Fish Go Deep. Fitting that it was the day before St. Patrick's Day. Just one of many amazing days I've experienced in my life where music was involved. I think we can all agree that music inhabits a certain place in all of our lives. It's honestly a big reason why George started this blog, in my opinion. We get to share not just music with you all, but who we are, as shaped by the music we've grown up around. Well, I have shared just that. And hope to keep doing so for all of you. Do you guys have any good stories from shows? Shows or nights out that helped define the person you are? If so, let 'em rip. With that said, it's time to bring it back to the original topic, which is Royksopp. They've released a new album, entitled Senior. Fitting since their last one was Junior. 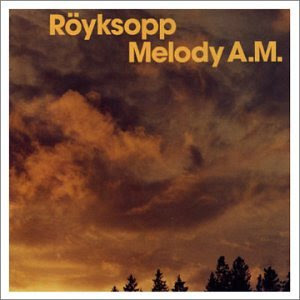 The mood of this one is decidedly more mellow, and shows the scope of who Royksopp are. In fact, check out the video for the tune "The Drug". Mildly disturbing, at points, but the music is pretty grand. Definitely a keeper of a track. Now, this post? I'm actually going to dig back in time with these guys. You're going to be treated to a couple of remixes off of their seminal album Melody AM. Those in charge of the remixes here? None other than Tom Middleton and Derrick Carter. Those of you that have been reading for a while may remember my interview with DLC, the Chicago house music legend. If you don't? Hell, go read it now! And Middleton is a familiar name to those of us that have followed electronic music for a while. He was half of both Global Communication and Jedi Knights. Pretty good resume of music, in itself. Anyhow, Derrick lent his boompty remix skills to the first track of Melody AM - "So Easy". Middleton's crafts are on display with his remix of the track most people would be familiar with - "Remind Me". Enjoy these tunes, guys! Now go buy something. NOW!